BLOGGold Monetization scheme is worth it?? Introduction of Gold monetization scheme in budget 2015 is welcome step taken by government. India is largest consumer of gold. Gold monetization scheme will help to convert physical gold in to cash, this will boost spending and investments, at the same time it will also reduce imports of gold. Gold is unproductive asset today, this step will make this asset productive. Let’s discuss about Gold monetization scheme and its benefits to investor. Gold Monetization scheme allows investor and jewellers to deposit physical gold with banks. Metal deposit account will be opened for this purpose. You can deposit any unused or broken jewellery into this account. Every transaction done for physical gold will be recorded. This facility allows investor and jewellers to earn additional interest on gold. Investor or jewellers can also borrow money using this account. Interest rate offered on gold deposit is not yet known, however it is expected that 4-5% interest will be offered on gold. One can withdraw gold from this account anytime. Bank and other dealers will also able to monetize this gold. 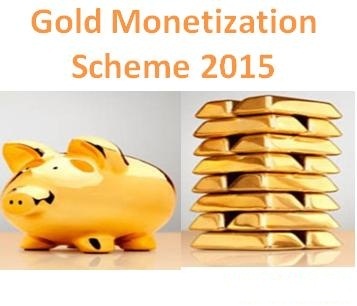 This Gold Monetization scheme will replace existing gold deposit and gold metal loan schemes. This scheme will reduce dependence on imported gold. As import will reduce it will enhance forex reserve and will help to control dollar price variation. With reduction in dollar price inflation can be reduced. This scheme will enhance productivity of gold as you can earn interest on gold deposit. This scheme will pull household gold in to economy. Gold monetization scheme will also boost GDP. Sovereign Gold Bond is alternate financial asset it will be alternative of gold purchase. Sovereign Gold Bond will carry fix rate of interest. Value of this bond will be likely to vary with respect to gold rates. This bond will be redeemable in terms of original face value. Indian Gold coin featuring Ashok Chakra will be made in India. It will remove need to import gold for investment purpose. Additional interest on gold bond is advantage to investor. Introduction of Indian make Gold Coin will help to recycle gold available in country. It will boost Make in India campaign. According to me it is very good step taken by government of India to boost economy. Investor should participate in this scheme to avail multiple benefits. Draft for gold monetisation is released by government recently. As per guideline given in draft following rules are applicable for gold monetisation scheme. The minimum quantity of gold deposit allowed under this scheme is 30 grams. Gold collected from customer will be send to test centre for checking of purity level. Once test is completed, customer can either deposit this gold or take it back by paying minor fees. Interest will be paid on deposited gold after 30/60 days of opening the account. Interest rate will be decided by bank. Principal and interest value will be valued in gold. If customer deposits 200 gm. gold and get 1 % interest, then maturity has a credit of 202 gms. Customer will be given option for redemption either in cash or in gold. This option should be selected at initial stage of gold deposit. Minimum tenure of gold deposit is 1 year and can be extended in multiple of 1 year. You can break this deposit at any time. No capital gain tax or income tax is applicable on this Gold saving account.